When a person decides to enter agreements with establishments and institutions, documents that certify the legitimacy of his or her personal details, good characteristics, financial independence and integrity, and so on will be required. That’s why in some cases, a landlord will be asked by the tenant to write a reference letter to confirm that he or she is, in fact, a resident of the rented property. Since it is a reference letter, it contains the name of the tenant, his or her house number, start and/or end of the tenancy, amount for rent, and other defining details that will help confirm the characteristics and/or other aspects the tenant may request. The letter will help the tenant get the approval of a new landlord, financial institutions, and other business transactions he/she wishes to enter. In this article, various landlord-tenant reference letter templates and examples that you can use are provided. As a tenant looks for a new prospect property to rent, he or she will still need the assistance of the previous landlord. Having a reference letter detailing how you are as a tenant will help convince the new landlord that you are an excellent candidate for the application. In that case, you should request your previous landlord to write a reference letter detailing the professional relationship you have shared during your stay at his/her property. 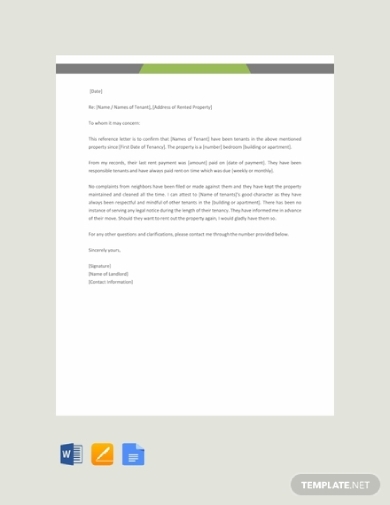 This landlord reference letter for tenant template is perfect to use for this situation. You can simply replace the needed information and let your previous landlord affix his or her signature. You can download this template for free and just edit it accordingly. 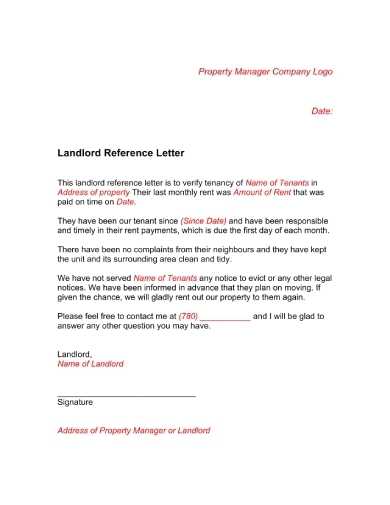 This tenant reference letter template can be used when you, as the landlord, want to confirm his or her tenancy in your property. This template follows a standard letter format and has considered all the details that might be needed relating to the tenant and his or her tenancy. It also has a short reference on the character of the tenant while on the property which will help give a small background as to how he is as a member of the community. If you are interested in using this template, you can download this one for free from this article; you can then edit its contents to suit your needs. You can easily edit this template in Google Docs, MS Word, and Apple Pages. As a landlord, you can help your tenant out by giving a clear and positive reference letter to confirm his or her tenancy. Like a character reference letter, you can include a description as to the characteristics of the tenant during his or her occupancy, i.e., has he/she been a diligent payer, has he/she maintained the property well, and so on. The same goes for a commercial landlord, you can endorse your tenant to other business or financial transactions with the help of a well-written reference letter. 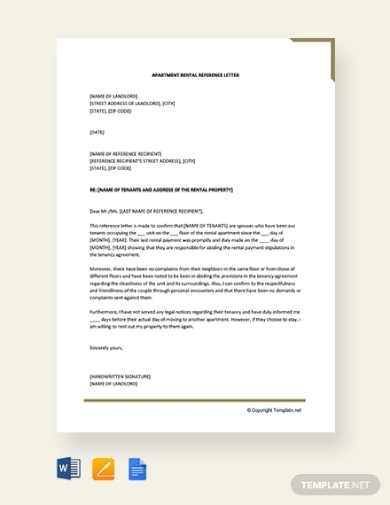 If you are looking for a template for that, you can download this commercial landlord reference letter template. This is easily customizable to help you easily incorporate the details that you are required to provide. 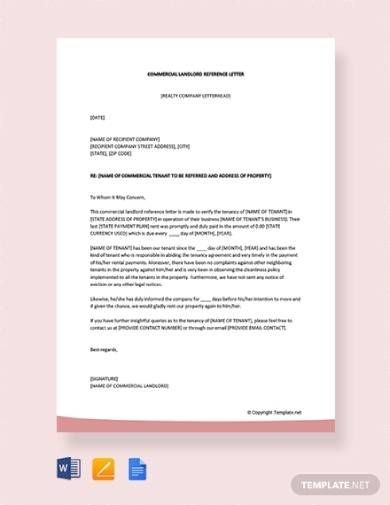 Help your former tenants find good new homes with the help of this apartment rental reference letter for tenant template. This template features a well-written and well-structured reference letter that states the details about the professional relationship you have shared with the tenant. This template will also allow you to include information about the tenant/s such as his or her name, unit and floor number, and the period of the tenancy. 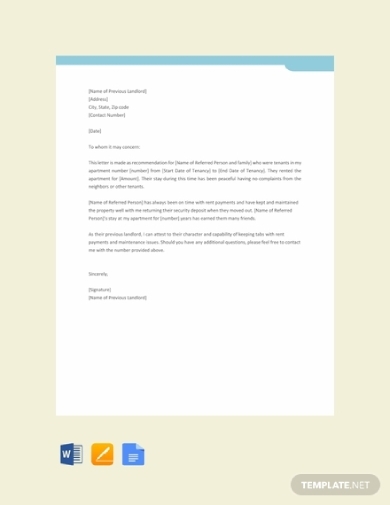 You can download this reference letter template for free and easily edit this to provide all the essential and necessary details. Should a tenant need proof and confirmation that he or she is, in fact, a resident of your property, you can provide a reference letter that states all the relevant information about the tenant. 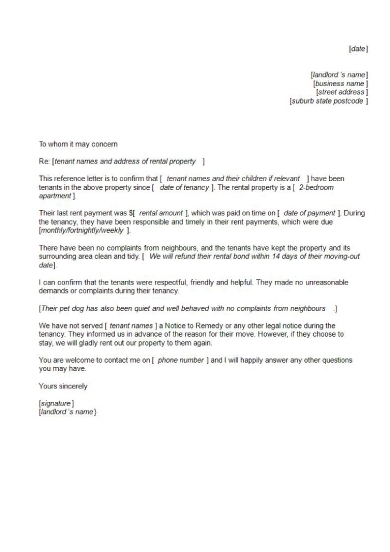 Looking at this landlord reference letter example, you can see how it has provided sufficient information about the tenant along with the landlord’s contact number should there still be any questions. You can use this example as a guide or basis when you write a reference letter to help confirm the tenancy of the tenant. This can help the tenant successfully get the approval for any other business transaction he/she may enter into. Confirming that a tenant is or has been a resident on your rental property means that a person has the capacity to pay financial obligations, that’s why a reference letter is needed when a tenant enters into other agreements with business establishments or financial institutions. In that case, as the landlord, you can help the tenant with the help of a detailed reference letter similar to this example. It is important to only include factual information and objective insight regarding the character of the tenant. The letter does not need to be long and complicated, so long as you clearly provide enough background and context then it is acceptable.